Alberta Provincial Highway No. 32, commonly referred to as Highway 32, is a north–south highway in west–central Alberta, Canada. From north to south, Highway 32 begins at its junction with Highway 33 in the Town of Swan Hills. It proceeds south for 69 km (43 mi) where it meets Highway 43 northwest of Whitecourt. After following Highway 43 southeast for 8 km (5.0 mi), Highway 32 continues south from Whitecourt for 72 km (45 mi), crossing the McLeod River, passing through the Hamlet of Peers, and ending at Highway 16 (Yellowhead Highway) approximately 32 km (20 mi) east of the Town of Edson. ^ a b "2015 Provincial Highway 1-216 Progress Chart" (PDF). Alberta Transportation. March 2015. Archived (PDF) from the original on April 10, 2016. Retrieved October 12, 2016. ^ a b Google (March 5, 2018). 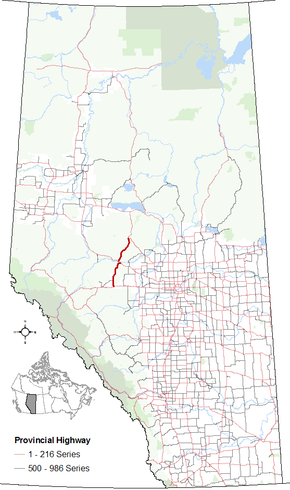 "Highway 32 in Alberta" (Map). Google Maps. Google. Retrieved March 5, 2018. This Alberta road, road transport or highway-related article is a stub. You can help Wikipedia by expanding it. This page was last edited on 10 November 2018, at 08:37 (UTC).